And then there were 16 … and no Germany. Qualifying for Euro 2014 sorted. There will be something a little unusual about the 11th Men’s European Handball Championship. There will be no Germany. The three-time World Champions and 2004 European winners finished third in their qualifying group and so will not be making the short hop over to Denmark. Sixteen of their fellow continentals did make it though (if we include Iceland as being ‘continental’) although Denmark had already done the decent thing and qualified as hosts and champions. There was a bit of last-day drama: in the last game of the process Macedonia beat Portugal and so leapfrogged over their Iberian guests; Austria had an emotional win over Russia but they both qualified anyway with Russia taking the only ‘best loser’ slot; Belarus won in Slovenia to snuff out the latter’s chances of taking their place. The final list therefore looks like this: Denmark, France, Spain, Iceland, Sweden, Hungary, Norway, Poland, Montenegro, Croatia, Serbia, Czech Republic, Belarus, Austria, Russia and Macedonia. There are no teams making their first appearance but it is the first time Austria have qualified – their only previous appearance was when they were hosts. The tournament will start on 14 January next year – about three weeks after the Women’s World Championship finishes in Serbia. 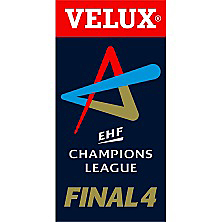 There is likely to be exceptionally good coverage via ehftv who do these things very well indeed. So who had HSV Hamburg for the title then? Not just when the Final 4 was drawn and it was clear they would have to beat the big beasts of THW Kiel and FC Barcelona but back in September when they only just edged the Wild Card tournament final (coming from behind to beat hosts Saint-Raphaël Var) and then pitched into a group that included Flensburg-Handewitt, Montpellier, Reale Ademar Leon and Chekhovskiye Medvedi. But, despite all those obstacles, HSV have earned the right to be called European champions. The Velux Final 4 had a bit of everything in the end. It had the relatively easy semi-final that showcased the grit of the victors: Barcelona on the back of 8 from Rutenka always had the edge over the Poles of Vive Targi Kielce. It had the semi-final with the result you didn’t see coming: Domagoj Duvnjak inspiring his Hamburg team-mates with 11 goals and Hamburg emerging victorious from a goal-fest. The Zebras almost unable to work out what had gone wrong. And then, in the third-place play off it had a confusion of names Kiel/Kielce (just me?) and the underdogs almost but not quite throwing away a 9 goal lead but hanging on – Kielce thus finished 3rd, Kiel 4th. And the main drama still to come. If Hamburg’s semi-final had been a goal-fest the first half of the final was a defence-fest and one that looked like going the way of the Catalans. But with the first five minutes of the second half having more drama than the entire first the game swung. Twice Barcelona were pegged back only to take the lead again. Across the court were contests – not least in the goal. Sterbik in the Barcelona goal proved almost impossible to fire past whereas the athletic Bitter for Hamburg found his blocking limbs. Heading into the final stages Hamburg somehow had a four goal lead with a fast break that could have made it five … but Jansen missed and within the blink of an eye (it seemed) we were all tied. With the score at 25:24 Rutenka had a shot saved by Bitter but the rebound went straight back to him rather than the defence and making no mistake a second time we moved to extra time. This was the first final to be decided in extra time and by now the crowd had discovered its German patriotism. I doubt there was a neutral across Europe wanting any result other than a victory for Martin Schwalb’s men. All were to get their wish but not before ten minutes of tension were played out. As always seems to happen the scoring slowed. Neither side wanting to allow the other to dictate the pace. Hamburg caught a break when awarded a 7m penalty for a phantom foul and when Lindberg (the tournament’s top scorer) hit it to put HSV in front that was that. Just the small matter of a Bitter save, a Barcelona steal, a shot over the top and a final attempt after time up to cram into the remaining 120 seconds. Hamburg had earned the right to cling on. Their joy was unconfined, Barcelona looked shell-shocked. “So much drama …” said ehftv commentator Tom O’Brainnagain. He was right. This was a final that reminded you of the straightforward magnificence of sport in general and the brutal beauty of handball in particular. I predicted a close one, I was wrong. There aren’t many in Barcelona tonight who will care. In the most one-sided final in the history of the competition, Spain were the winners in front of an ecstatic home crowd. The most significant damage was done in the second quarter as a one-goal match turned into a 18:10 lead for Spain over the suprisingly underwhelming Danes. Joan Canellas top-scored for the Spanish with 7 and he and his fellow attackers were backed up by a stingy defence and some excellent goalkeeping. 20,000 saw the match in the hall – no doubt a few million more across Spain saw it on TV. It’s the biggest story on the El Pais site right now. 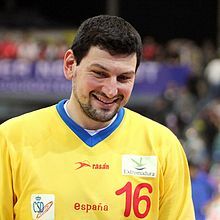 The boost that Spanish handball maybe needed. The Danes may be sore but they can look forward to next year and being Euro 2014 hosts. For now, though, the glory is all Spain’s. Seven unanswered goals in the first ten minutes of the second half turned what had been a fairly even and compelling match between beaten semi-finalists Croatia and Slovenia into a one-sided stroll. Croatia took it from 14:14 to 21:14 before eventually taking the match 31:26. Domagoj Duvnjak again top-scored for the Croats, this time with 9 goals. So, here we are then. The European Champions against the hosts in a battle for the world title. Spanish handball had so much riding on its first ever hosting of the World Championship. Despite the strength of the top teams in the Asobal the rest of the league hasn’t had such an easy ride and there were fears that the public’s attention may be wandering … Hopefully a sell out of 16,500 in Barcelona and a clear shot on a Sunday afternoon should go some way to reminding the good people of Spain of the great game they have in their midst. And, hopefully as well, they will get to see a classic final regardless of who emerges triumphant. Denmark came so close two years ago. France defeated them in extra time. But, since then, they’ve had experience in winning despite a passionate home crowd urging them to defeat – their taking of the Euro 2012 crown came against the hometown Serbs and their deafening support. Perhaps significantly (though perhaps not) Denmark beat Spain in the semi finals in Serbia – and whilst their matches have always been close (the average difference is under 2 goals) it is Denmark who have won six of their last seven meetings. None of those matches were in Spain in a home World Championship though. Spain have clearly relished the crowd. In their match against Serbia, for example, it seemed to be the extra man forcing opposition fumbles and propelling fastbreaks in response. When they fell behind against Germany it’s hard to see how their momentum back into the game could have been maintained without the surging insanity of the home support. Things might have been more straightforward against Slovenia but then the Slovenes can’t have enjoyed that every moment that something didn’t go their way the crowd reacted as if someone had given the title to Spain. For all the Spain are a strong side without the added extra the home advantage brings it would be hard to predict a victory for them. Spain have scored the second most goals in the tournament: 245 in 8 matches. Want to guess which team beats them and has a significantly better scoring percentage in doing so? In Albert Rocas and Victor Tomas, Spain have two great counter-attack shooters and 7m takers. On the other hand, Denmark have Anders Eggert who has 23/24 from the penalty line. Both teams move the ball nicely to the wing when needed but have a good variety of attacking options – but maybe Denmark have the upper hand in being able to call on Mikkel Hansen to impose himself when needed. His tournament has been a bit underwhelming so far by his talismanic standards – Spain will hope it remains that way. In defence, again, they are similar but you’d have to give Denmark the edge. Spain have a save percentage of 34%; Denmark 37%. The stat that could be significant in a match where turnovers and pounces on mistakes could be critical is that Denmark have done a much better job at preventing opposition fastbreaks turning into goals. Against Croatia, as well, it was noticeable that Denmark were able to (fairly) physically impose themselves into a game to prevent attacks spreading; Spain failed that test against Croatia and it resulted in their only defeat in the tournament. They’ve not faced a similar team since but Denmark will need to be stopped somehow. So, there will be goals. Lots of goals. Spain will be hoping for more and more because if the game is high scoring it’ll mean the Danish defensive strengths aren’t working and we’ll be in a shooting match that either team could win. A tighter or more controlled game – one that silences the crowd for stretches – and you’d have to back Denmark. But, honestly, this could go either way. 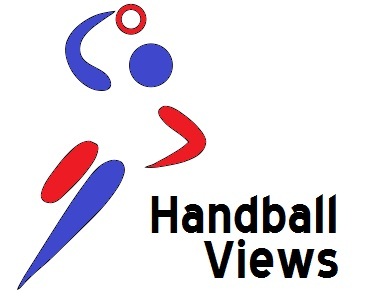 What Handball Views says: Denmark. Spain. Denmark. Spain.